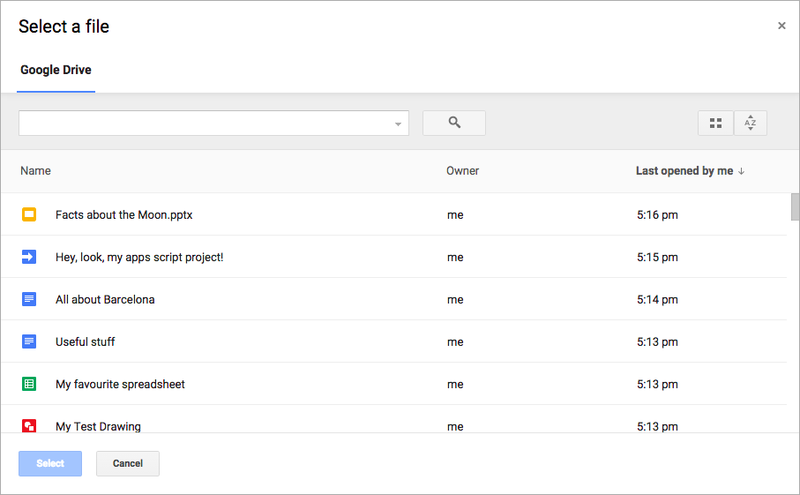 You can let users open or upload Google Drive files in your web app with the Google Picker. After a user selects a file, the Google Picker API sends the file ID to your app so it can access the file. Note: You can also let users open files from Drive in your mobile app. The Storage Access Framework on Android is similar to the Google Picker. See G Suite APIs for Android or G Suite APIs for iOS to get started. Below is how the Google Picker displays a list of the signed-in user's Drive files in a web app.